iOS developer training firm Shiny Development has been tracking review times for iOS and Mac App Store submissions for some time, crowdsourcing data from developers disclosing their waits in Tweets. The tools provide an interesting look at how review times have varied over time, and they reveal that there has been a substantial increase in those times for Mac App Store submissions over the past six months. Shiny Development's annual trend graph for Mac apps shows average review times of a few days to a week through approximately April 1 of this year, after which time the trend began a fairly steady rise. That rise has accelerated in recent weeks, with developer reports now indicating that their apps are spending an average of nearly a month in review. The sample size is admittedly small for Shiny Development's Mac App Store calculations, with 62 reports having been collected over the past 30 days, but the firm reports that the data is generally fairly indicative of broader trends in their experience. The averages on this site are based only on the data gathered from Twitter which are a very small subset of the total number of apps which go through review each day. However in our experience it does give a reasonable indication of how review times are changing over time. The trend for iOS apps is less severe and is based on more substantial data as would be expected for the larger iOS App Store, with 471 data points being included from the past 30 days. Average iOS App Store review times have been within a range of 3-11 days over the past year and currently sit at one week after declining from their peak roughly two months ago. Developers interested in contributing to the project can find tweet their waiting times using the respective #iosreviewtime and #macreviewtime hashtags, and Shiny Development offers a few guidelines on how times should be calculated. Several Apps I've bought via the App Store have gone through three and four updates in the real world, but still no updates showing up in the App Store. Very frustrating; I thought updates would at least get a bit of a fast track. No wonder users and developers are getting fed up. There is nothing worse than a graph Y axis that has no units stated on it ! But I want Tweetbot *now*. All hands are probably on deck buttressing Apple's Maps app. 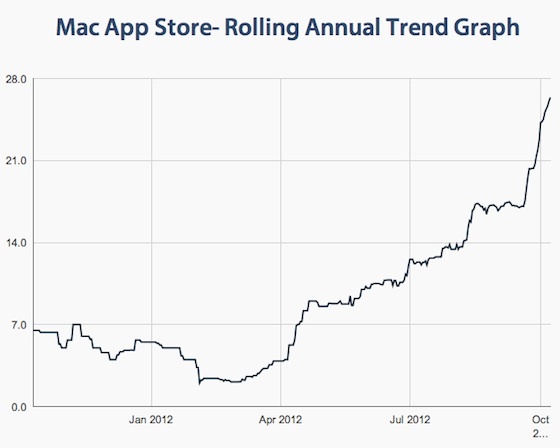 Speaking as a developer with a number of apps in the Mac App Store, the graph EXACTLY matches our recent experience. The last few updates we've submitted have taken more than 3 weeks to even enter the review process. It's actually pretty frustrating when you're trying to push an update (or bug fix) out to users and you have to wait WEEKS for Apple to get around to reviewing your app. I don't know if Apple is understaffed or getting inundated with new apps, but they've got to do something to improve the situation. Spend a few of those billions of $ and hire some more reviewers. After all, they're taking 30% of all app sales, so one would expect a little faster service. Tough to draw any conclusions from such a small sample size, but maybe Apple should hire more reviewers for the 6 months surrounding a new iOS release. A company with $100B in the bank should not have this problem. Apple seems to have a number of internal mismanagement issues. Of course there's a smaller thing to note -- Apple makes relatively little revenue from their app stores, so they don't have much financial incentive to make sure the stores run smoothly. They know the Google app store is no competition for developers right now. But it's no excuse, because ultimately it harms users as much as it does the developers they buy from. Apple really should "permanently approve" trusted developers once they prove they are trustworthy, allowing app updates to go out without each one having to be approved. App makers who frequently release bugged updates can lose their "trusted" status. It's not hard! I should add that Transmit took over a month to approve the last update. This is a $35 app, too, so it's not a money issue. I'm a new Mac developer. My experience has been frustrating. - Apple documentation is very good, but there has been many changes to the platform that are not reflected on it. You'll find a lot of sample code with and without @synthesize, without ARC and calling old API's, such as QTKit instead of AVFoundation. That's not really good for new developers. - Sandboxing and receipt validation are challenging topics poorly covered by Apple. Open console and see dozens of messages for which there is absolutely no explanation on Apple docs or forums. After ML 10.8.2 update (after my app was approved) the console started showing a sandbox error related to my login helper. Can't find an answer for that. - In-app store (for Mac), test user management and purchase control is another nightmare. There is no purchase reset. For every purchase test you need to create a new test user (with a valid email that can't be an Apple ID). So, for hundreds of tests, create hundreds of gmail accounts and add them to iTunes Connect. What a shame. - We can't search for known bugs and make sure that an error message is not related to our app. Rdar is a post-only system. I have filed bugs and after 45 days they are still "open", with absolutely no indication of what has been done. - Their developer forums are a joke with few questions and no answers. I have tried it in vain. No answer. And there is no place to run to if you have urgent problems. Not even an email address dedicated to developer questions. - My first app, Did I Click, took 28 days on the "Waiting for Review" status. I asked for an expedited review but it was declined (and I heard you got 2 per year). It was launched in September (before the iOS6 and maps-gate). - The day after the app launch a user posted some suggestions which I promptly attended. Submitted the update right away. It's been 22 days and it is still on "Waiting for Review". I can't even tell the user I have done the update. - I have just submitted my second app and am not expecting it to be on sale in less than a month. And after two months of testing I'm praying to God there is no bug on it. My general feeling is that Apple does not really care about developers. They care about consumers. Developers are just part of their ecosystem with the purpose of attracting consumer's attention to a platform with a variety of apps. The worst thing is we, as developers, can't make mistakes. Let alone be proactive and try to keep user satisfaction. With any code change taking 30 days to deploy, we are limited to having a very stable app with only 2 to 3 updates a year.